GOLETA, CA…Due to recent rainstorms, seasonal road closures are in effect on the Pine Mountain/Reyes Peak Road (Forest Road 6N06), Cherry Creek Road (6N01), and the Nordhoff Ridge Road (N508) located in the Ventura County region of Los Padres National Forest’s Ojai Ranger District. Nordhoff Ridge Road and Pine Mountain/Reyes Peak Road will remain closed to vehicles until May 1, 2012, and Cherry Creek Road will remain closed until August 1, 2012. Pine Mountain/Reyes Peak Road (Forest Road 6N06) intersects Highway 33 thirty-two miles north of Ojai. It provides access to Pine Mountain and Reyes Peak Campgrounds and the Reyes Peak Trailhead. Cherry Creek Road (6N01) intersects Highway 33 twenty-seven miles north of Ojai. 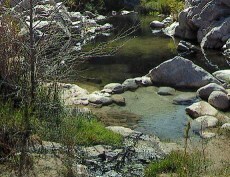 It provides access to the upper Ortega and North Fork Matilija Trailheads. TheNordhoff Ridge Road (N508) is also accessed from Highway 33 through Rose Valley Campground. This road is accessed by permit only. For further information on winter road conditions, recreation opportunities, and permit requirements on the Ojai Ranger District, call the Forest Service office in Ojai at (805) 646-4348. The office is open Monday through Friday, 9:00 am to 12:30 pm & 1:30 pm to 4:00 pm.